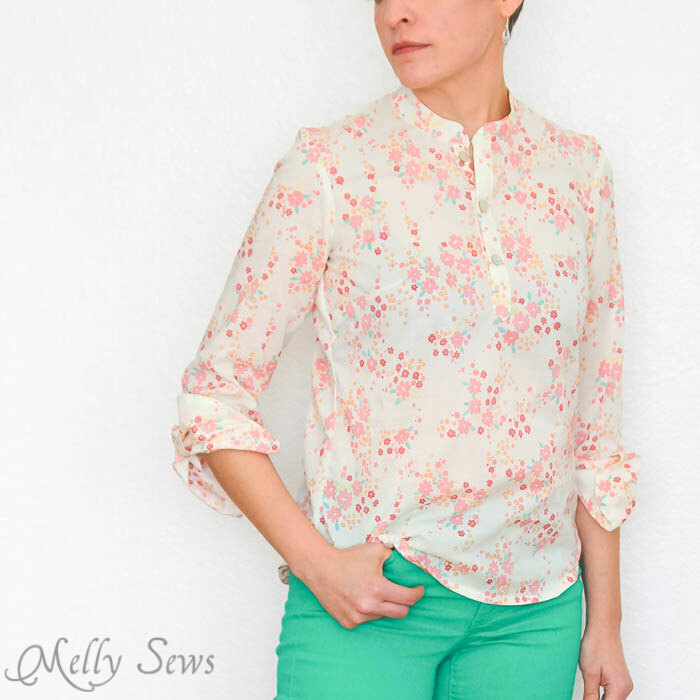 As promised from Tuesday’s post, today I’m going to share a continuous placket tutorial that can be added to any shirt or dress. 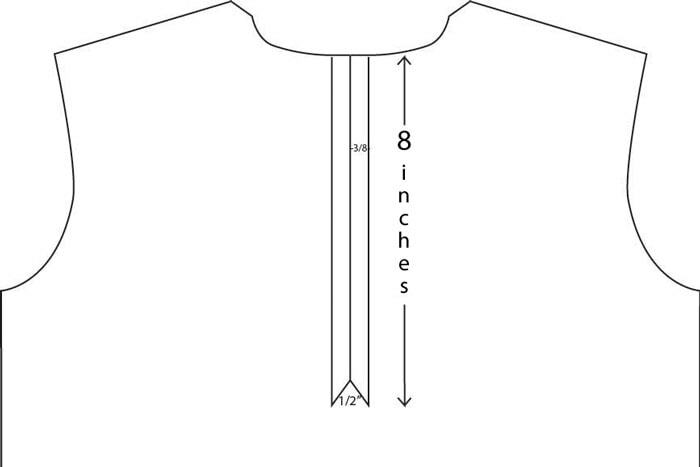 To begin, determine the length of placket opening you’d like to add. For mine I did 8 inches. 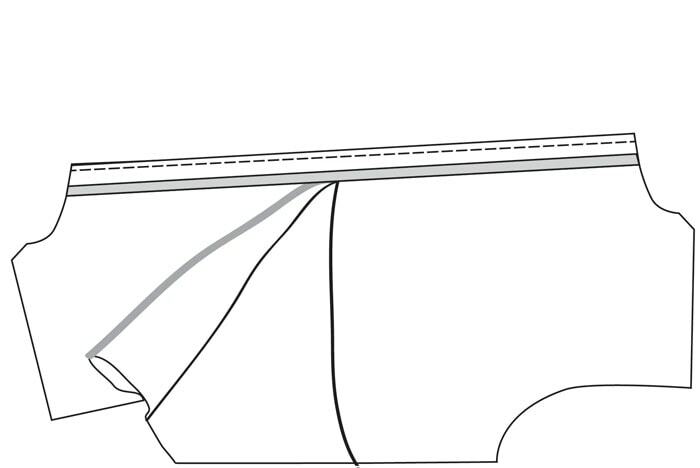 Mark a line this length down the center front of your shirt. 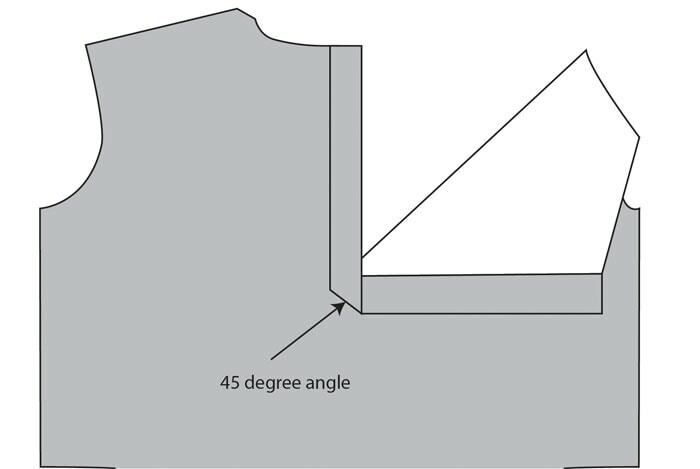 Make lines the same length 3/8″ to both sides of your center line. Connect these lines across the bottom to make a rectangle. Mark a dot 1/2″ up from the bottom on the center line. Connect this do to the corners or your rectangle to make a triangle. 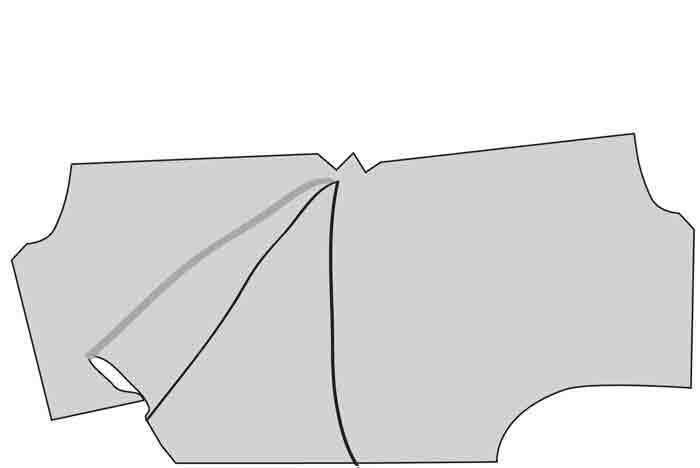 Cut down the center line until you get to the point of the triangle, then cut on the sides of the triangle. Spread your shirt open flat along this line. 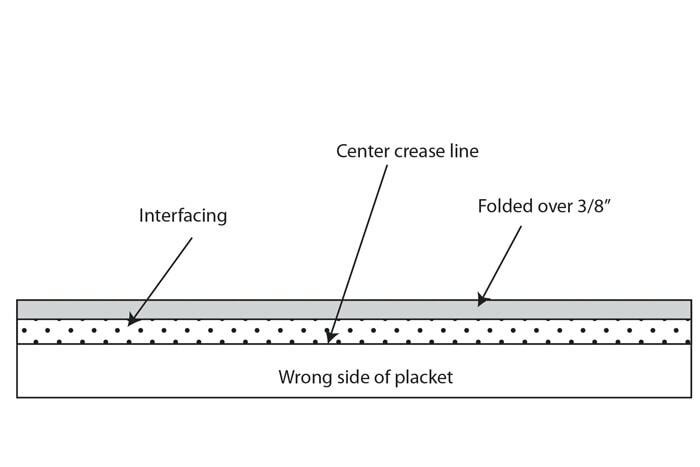 Cut a rectangle that is 2 x the length of your placket opening + 1″ and 2.5″ wide. This rectangle will be your placket. Fold it in half, wrong sides together, matching the long edges and press. Then cut a length of fusible interfacing that is 3/4″ wide and the same length as your placket piece. Fuse this to the wrong side of your placket, lining the edge of the interfacing up with the crease from ironing the placket. On the same half of the placket, press the long edge in 3/8″ toward the wrong side. Next, with the wrong side of the shirt and the wrong side of the placket facing up, align the unfolded edge of the placket with the placket opening. Pin. Stitch, using a 3/8″ seam allowance. This should just barely cover the points cut in around the triangle. Turn the shirt to the right side. Fold the placket around so that the folded edge just covers the seam you made in the previous step. Press and stitch. 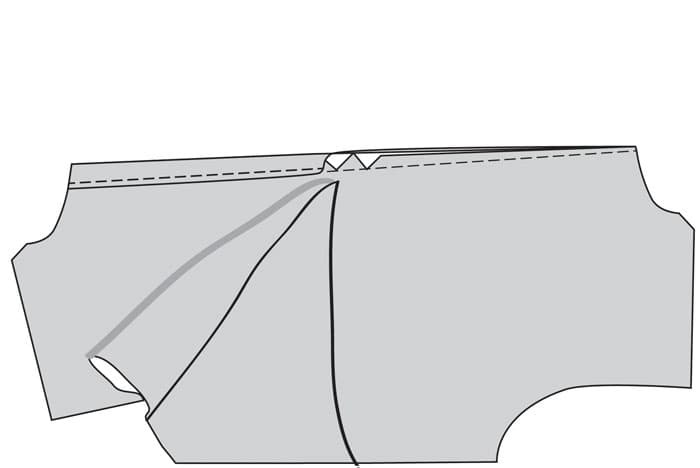 Fold one side of the shirt down as shown, so that you can create a 45 degree angle at the bottom of the placket. Press. 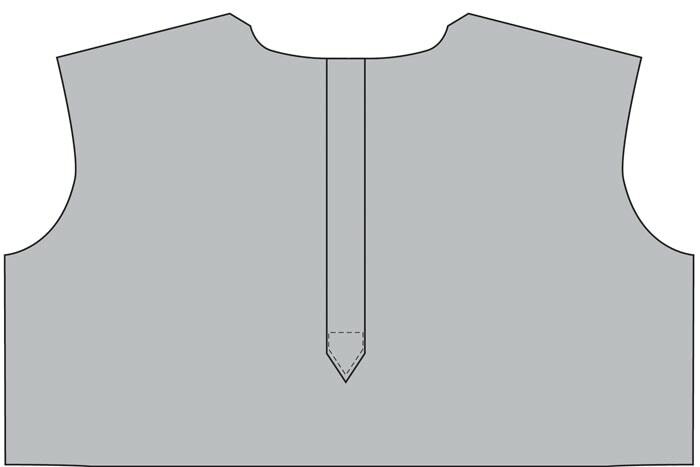 Fold the side of the shirt up, holding the point of the placket with one finger, and overlapping the placket, creating a point at the bottom of the placket. Stitch around the bottom of the point to secure the placket. Mark and sew your buttonholes on the top part of the placket. 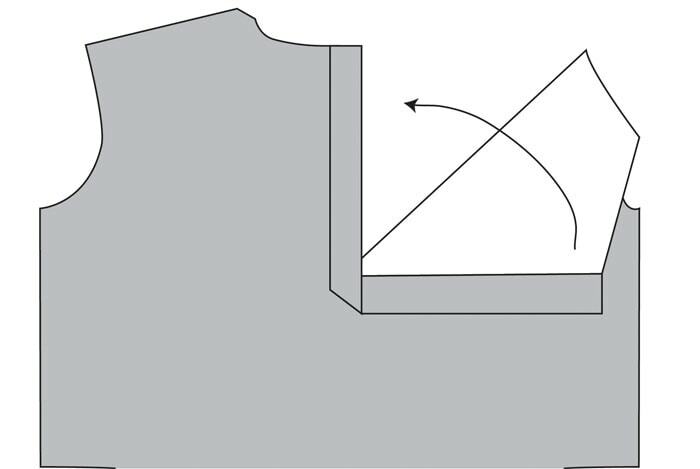 Technically, the way I’ve inserted this placket in both the shirt I made myself and the diagrams is the way you’d do this on a men’s shirt. 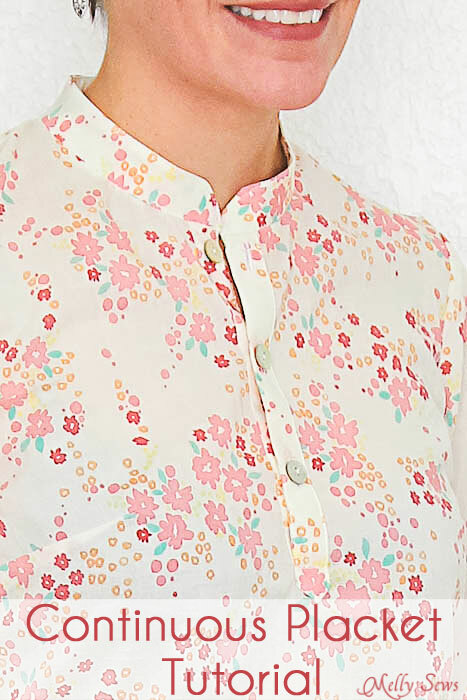 On a women’s shirt the right side of the placket should be overlapping. So if you want to get technical, fold the other side of the shirt down when you are folding the placket in place, so that you end up with the right side on top instead of the left. Thanks so much! I’ve only ever put in one placket in my life and I was using a pattern from one of the big 4 so the directions were not nearly as concise and useful as yours! I always learn such useful new things from you. Thanks so much for sharing with us all! Thank you so much Melissa!!! I have been trying to “clone” a RTW shirt dress with a partial placket down the front and had no idea how to sew it. Your instructions have just made my whole week!! THANK YOU!!! I have sewn several mens shirts from 60+ year old patterns, and the directions always say “insert placket”… and that’s it! I’ve usually figured it out, but they never look as clean as I’d like them too. I have a feeling this tutorial is going to help dramatically! The placket tutorial is so great! I so hope you could create a tutorial for that stand-up collar pictured above! I’ve sewn a similar collar a few times, and all of those times I’ve had to tweak the pattern pieces to fit everything together… there must be a trick! THANK you! 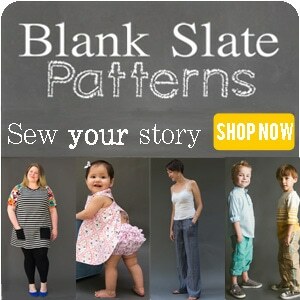 It seems whatever I’m seeking for my sewing, I find it on your blog. Great tutorial and exactly when I needed it! Thank you for sharing. Thank you for putting this tutorial together. I am constantly referring back to this, to make sure I am doing it right. And my plackets turn out great every time. Thank you! Thank you so much for this – I’ve been wanting to use this on nightshirts instead of sewing a centre front seam. Once again your tutorial has got me out of a pickle. Always concise and informative. I enjoy reading your e mails and picking up snippets (what a lovely word) of wisdom. Thanks so much for the placket tutorial. Can this be used on knit fabric and can I adjust the width of the placket to make it look wider on the finished tee shirt. 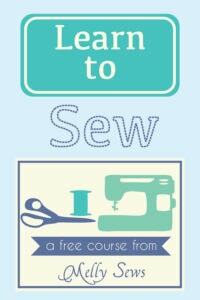 Thank you so much for your tutorial – it has helped me a lot with my first button placket. Wonderful explanation!! !